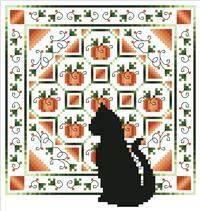 #10 in the Cats And Quilts series, this is the October design. A black cat sits in front of a pretty orange geometric pumpkin quilt. *Large print, easy to read black/white symbol chart with colored back stitching lines.